Let’s do this! It’s time to get serious about your health! By following the Perfect Plate meal plan, your experiences may include but are not limited to: more energy, a healthier gut, a sense of accomplishment for following your plan, weight loss, relief from carb induced comas, more time, no cooking, no thinking, no dishes. Are you ready to feel the difference!? We are ready to show you the way! Let Perfect Plate take the guesswork out of meal prep so you can enjoy the benefits of healthy food made easy! How it Works: Purchase a small or large meal plan based on your needs. We recommend a small plan for women and a large plan for men. The meal plan includes breakfast, lunch, dinner, and 2 snacks for 6 days. 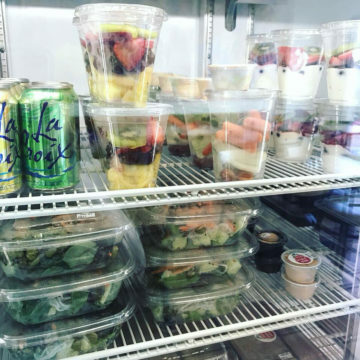 You will pick up half of your meal prep on Tuesday and half on Friday from 5pm-8pm. When you come in, you will choose from the variety of options we have freshly prepared. From there, we can help you write a specific plan of what meal to eat and when to eat it in order to maximize your energy and efforts. *Perfect Plate must have a 48 hour notice to begin your meal plan. This means that your order must be placed by Sunday for Tuesday’s pick up and Wednesday for Friday’s pick up. **There is only a 1 week commitment at a time so give it a shot. You only regret the chances you didn’t take.